I'm sure we all get pumped up as soon as this item arrives in the mail! As usual, this year I went to the show with Dave Lindquist and Don Smith. Dave and I left Rochester Hills, Michigan thursday afternoon, golfed with Don at Egypt Valley in Grand Rapids and spent the night. After 16 holes in the morning, we headed to Chicago with Don's wife. Our plan was to meet my wife and Dave's at the Schaumburg Marriott around 4:00 and then go to the auction and show while the women wasted money at the mall. It's a small price to pay to have peace at the Expo! We decided not to stay at the Ramada for the first time in 7 years. Having to pay for parking last year in addition to the hotel being a dump and $35 more expensive than the Marriott made this an easy decision. I heard they are blowing up that hotel. That's a productive use of dynamite if you ask me. Don decided to bring his Williams Jive Time to sell in order to make room for his yearly purchase. Don had done a great job restoring this game with his box of crayons! I figured he would be lucky to get $135. He was counting on $200 and planned to buy it back if it went for less. Early in the auction, Don won the bid for the Jurassic Park, so he had no room to put the Jive Time if he bought it back, so it was going to some lucky soul! Here's Don checking the game in: There's Carl Heller checking out a game while Don check's in: I had to fix the damn game for Don after the ride to Chicago! Don is checking to see if I did a good job fixing his game. There's Don playing his last game before the auction starts. Here we go . . . - Chris says that the Jive Time is "workin' all the way" Don plays the game during the bidding. Dave and I were laughing our heads off. don was pretty darn nervous! . . . "sold for $150"
We managed to get some good pictures with some regulars that most of us know. Check out the full sized versions. I snaped this picture and ended up with Clay and Tim Arnold in the background. Can't I get even one serious picure of these guys? No they didn't win. They were borrowing Okay Don, I'll put this pic on my web page and tell the whole world you won the big trophy. Smokin ! This one got a big laugh when it started smoking just before the bidding. No "it's working all the way" on this one! This Buckaroo was in pretty good shape. I don't know what it went for, but it was more than I would have spent. To buy or not to buy. I dropped out at $150 and it went for $160. With 3 projects in the basement, I didn't want another one even though I'd been looking for an OXO for 3 years. Personally, I think the show was pretty lame this year. I only collect the EM's, and there was not much there. I think Rob Berk's booth was the weakest it's ever been. 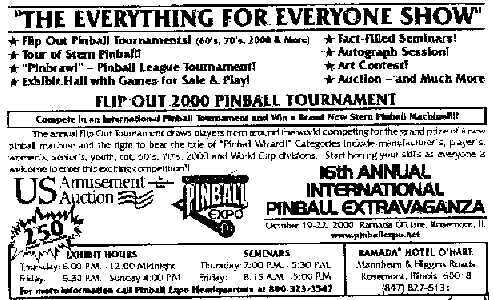 Before I could get there, someone had bought all the good games from the Pinball Exchange. I will say that the Pinball Exchange had some pretty nice games for sale at reasonable prices. I really missed having Steve Young there. I'm sure Mayfair jacked up pricing a little bit because of that. Can't blame them - I would have done the same thing. Looking through Gene Cunningham's pictures was fun. I almost didn't come back on Saturday. I managed to get some good autographs at the autograph session this year. That was the first time I had done that and I will do it again. I got Dave Christensen and Greg Kmiec to autograph a Captain Flyer which I will hang up, and I also got my Cirqus Voltaire flyers signed. Steve Kordek signed a flyer for me. I have several games that he did so that will hang in my gameroom too. Dave only got a book. No machines at all. His daughter broke her ankle and he and his wife had to go home early Saturday. Nice job Melissa. Next time stay off that trampoline. Don bought a Jurassic Park at the auction. It's working fine. The biggest problem was getting it crammed into the Grand Cherokee. He also bought a new backglass for his 4 Million BC and a German Fireball backglass from someone who had an ad on the board outside the Expo Hall. I was lucky on Saturday. We were originally going to take the women downtown for the day because I had given up on the show after Friday night. They decided to shop in Schaumburg which was fine with us, so Don and I went back to the show. Right when we got there, someone was wheeling in a some old games by Gene's booth. One of them was a Williams Strato-Flite. It was dirty, but everything was there and the backglass was very nice. I picked up for $225 and it's already in my gameroom and believe it or not, "workin' all the way"! 4 score reel contacts out of adjustment, and a good cleaning on the 10, 100, and 1,000 point relays is all it took. I will shop it over the Thanksgiving holidays. It looks nice next to my Skylab. Since I just finished my gameroom, you should check back for my gameroom pics in a couple of weeks to see the Strato-Flite. Don and I stayed the rest of the day and played Pinball.